Today, Artificial Intelligence has become a topic of discussion for top Business and marketing leaders. And considering the speed with which businesses are becoming technologically advanced, the need to know about Artificial Intelligence and the need to plan about it in their business and marketing strategies cannot be overlooked. Over and over again, we have seen examples of leaders who don’t understand artificial intelligence, who don’t understand how to plan for it. 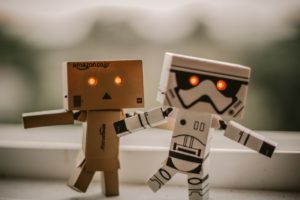 So, lets tackle the AI beast in this post and see the importance of Artificial intelligence in marketing. Artificial intelligence in marketing is not really a machine making marketing strategies for humans to follow but it is about one of the following three applications. Supervised Machine Learning: When the machine learning algorithm is being supervised by a person it is called supervised machine learning. A Machine learning algorithm is given a teaching set of data (input) and its possible outcomes (output) from which algorithm can learn from. With time the algorithm starts learning from the input and output fed in and starts making decisions.The person supervising the machine learning can double check on the results/decisions made by the machine learning and make sure that learning is appropriate. Unsupervised Machine Learning: Unlike supervised machine learning, unsupervised Machine learning is not provided with a teaching dataset but instead is given a dump of data (input) which it explores to identify the patterns and associations. Deep learning occurs when an algorithm can process larger datasets and solve more complex issues because it teaches itself the rules.Deep learning occurs in information layers. The algorithm builds off the findings of one layer of information to create a deeper “network” understanding of the data. Clustering is one deep learning technique which helps the algorithm to establish rules through a series of questions of true or false. These questions are asked over and over, until the machine learns all the answers to the questions. These answers become new rules for algorithm and the rules evolve whenever algorithm encounters new data. In this way, the program gets smarter and learns from its mistakes. Siri and Alexa are common and best examples/tools which filter speech using an application of artificial intelligence called Natural language processing.The ability to understand language, detect sentiment and to understand the complexities of a question, all come under the purview of Natural Language processing. Forbes and American press association have already adopting artificial intelligence to produce more articles quicker enabling their journalists and content creators to do more of substantial reporting, rather than wasting time in creating formulaic content. Editorial planning is one phase where artificial intelligence applications really succeed in. Machine learning algorithms can find emerging topics to ensure that the content is relevant at the time of getting posted. In this competitive world, where businesses are facing cut throat competition from every corner, providing personalized customer experience at every step of the user journey is of paramount importance. The need to be there for your customers 24/7 has become essential for the companies and Online messaging tools and Chatbots have turned out to be some of the most exciting innovations in customer service positioned as perfect solution to this problem. These bots leverage machine learning and Natural language processing to detect patterns, spot repetitive questions and predict what’s causing issue to a user and slowly build on these capabilities to respond to individual customer queries. From fashion to health to insurance, product recommendation tools use machine learning algorithms to sort through customer information. Product images are sort through by machine learning algorithms and is compared to a customer’s purchase history in order to recommend a new product. Algorithm continues to evolve and learn about a customer. So, the product recommendations slowly transform from basic product attributes to consider from to more individualized behavior and preferences. Personalized website experience: By analysing data points like location, demographics, device, etc artificial can display offers and content which are best suited to that user.Push notifications also play an important role in creating personalization by delivering the messages curated for a specific user. PPC Advertising: Artificial intelligence in marketing can help businesses uncover new advertising channels and how to optimize the spending’s and customer targeting. So, above points covered how Artificial intelligence is affecting and helping in building marketing strategies. It’s time to embrace the change and make the most of it.